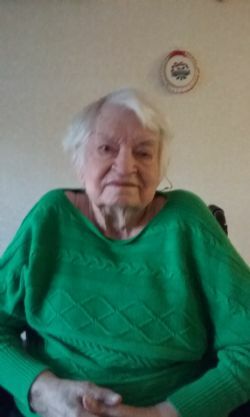 Mrs. Evelyn E. Smith, at the age 103-years-old, of Willowbrook, Illinois passed away on Monday, February 4, 2019. She was born to the parents, Harrison and Lena (Guisewite) Froman at Mount Carmel, Illinois on July 14, 1915. Mrs. Evelyn married Norman Smith on October 29, 1937 in Mount Carmel where they lived about 25 years. She was a tireless shopper, avid bingo player and talented crafter. She walked daily and was a member of TOPS. Evelyn moved to the Chicago area in 2007 to be closer to her family. Evelyn was a member of St. Peter's Council Catholic Women and the Ladies organization at the Elk's Lodge in Mountain Home, Arkansas. Mrs. Evelyn Smith is survived by her two children James Smith and Janice Anderson; grandchildren, Troy Smith, Ryan Anderson and Kyle Anderson; and four great grand children. In addition to her husband, she was preceded in death by her sister, Helen Hughey and a grandchild, Tracy Smith. Funeral services will be held at 11:00 am on Monday, February 11, 2019 at Roller Funeral Home Chapel with Father Nazarus Maduba officiating. Interment will be in Baxter Memorial Gardens.